Your only at the cottage a few days a week, why waste all that energy keeping your water hot? A tankless is perfect for cottages and only heats water when your there and when its needed. So save some money this summer and have a tankless water heater installed at your cottage, or if you’re a do-it-yourself’er and only need us to supply you with the system, we can help you with that too. 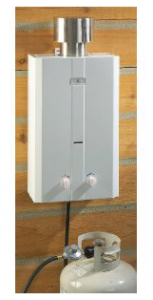 A cottage country tankless is a great, cheap solution for your cottage water heating needs. There is a growing demand for small to medium sized propane tankless water heaters as cottagers are looking to reduce their electricity bill and the water heater is a significant consumer. If your only at the cottage on weekends it really doesn’t make sense to heat your water 7 days a week. We offer a number of tankless systems that work with various sized propane tanks and only use energy when you want hot water as opposed to consuming it all week long. Tankless water heaters have freeze protections systems built right in so you know your investment is protected. We know a lot of cottage owners are also the “do it yourself” kind of people and for this we offer shipping right to your door. If you have decided to upgrade to a tankless at your cottage give us a call or fill out the form and we can help you choose not only the correct size tanklesss but also one that fits your budget.